Unlimited data plans allow you to download as much as you like, with always on data. We compare unlimited data plans on giffgaff, SMARTY, Three, Virgin and Vodafone. Whether you’re a heavy smartphone user or whether you just want the reassurance of never running out of data, several UK mobile networks now offer an unlimited data plan so you can download as much as you like without worrying about your data limit. At present, it’s possible to get an unlimited data plan from either giffgaff, SMARTY, Three or Virgin Mobile in the UK. With all of these plans, you can stop worrying about how many gigabytes you’re using and you’ll never again run out of data mid-month. As a cheaper alternative to unlimited data plans, you can also consider a zero-rated data plan which gives you unlimited data for a number of services. These are available in the form of Three’s Go Binge, Vodafone’s Passes (also available on VOXI) and Virgin Mobile’s Data-Free Messaging. In this article, we’ll review and compare your options for an unlimited mobile data plan in the UK. giffgaff Always-On Data 4G speeds are only available on the first 20GB per month. After this, speeds are restricted to 384kbit/s between 8am-midnight. SMARTY Unlimited Data A fair usage policy of 1000GB per month applies. Three All-You-Can-Eat Data A fair usage policy of 1000GB per month applies. 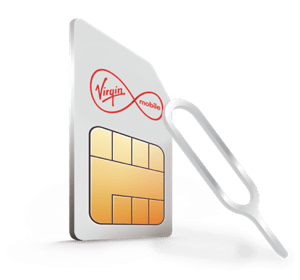 Virgin Mobile Unlimited Data Only available to Virgin Media TV and Broadband customers. giffgaff offers 4G coverage from O2, whilst Virgin Mobile offers 4G coverage from EE. SMARTY is a low-cost sub-brand of Three, which has its own mobile network offering 99% 4G population coverage (see their online coverage checker here). 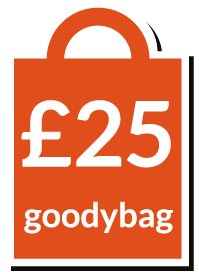 Normally, giffgaff’s £25 goodybag and SMARTY’s £25 unlimited plan are the cheapest and most flexible unlimited data plans (both are available on a 30-day rolling basis). However, discounts and offers may sometimes make the unlimited data plans from Three and Virgin Mobile better value overall. 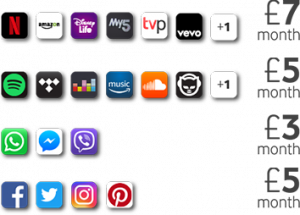 Three Go Binge Netflix, Snapchat, Apple Music, TV Player, Deezer and Soundcloud. 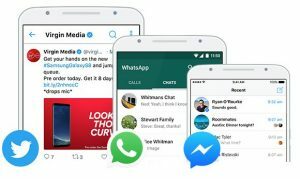 Virgin Mobile Data-Free Messaging WhatsApp, Facebook Messenger and Twitter. Vodafone Vodafone Passes Multiple video, music, chat & social providers (depends on the pass). VOXI VOXI Endless Passes Snapchat, Instagram, WhatsApp, Facebook, Twitter, Pinterest, Viber and Facebook Messenger. Video and music providers available at extra cost. Through the rest of this article, we’ll review each of the unlimited and zero-rated data plans in more detail. With Always-On data, you’ll only get full 4G download speeds on the first 20GB per month. After this, your speeds will drop down to standard 3G (384kbps) between 8am and midnight each day. This may stop you from doing things like streaming music or video from the internet, but it shouldn’t prevent you from browsing the internet or using messaging services. Because of the speed reduction after the first 384kbps, giffgaff’s Always On data plan may not be suitable for very heavy data users. However, it’s a good option if you’re mainly looking for some peace of mind, and is available on a one-month rolling basis with no credit check required. SMARTY is a low cost sub-brand of Three, offering SIM-only deals on a one-month rolling basis. 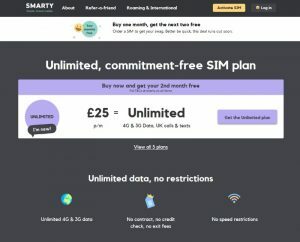 For £25/month, you can get the unlimited plan from SMARTY which comes with unlimited minutes, unlimited texts and unlimited data. Our Unlimited plan is the only 1-month tariff available that’s open to everyone and has no speed restrictions (unlike another plan out there). Tethering and personal hotspot use is also included as standard on the plan. We have set a usage cap at 1,000GB. When tested, using a mobile for every minute of every day only used around 1,000GB in a month. Setting this cap helps us to identify any commercial use of our services, which is not permitted by our terms and conditions. When travelling in the EU, customers will be subject to our fair use limit of 19GB each month. 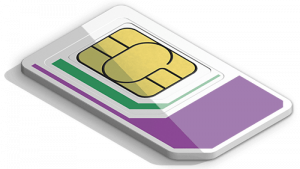 SMARTY offers 99% population coverage, using 3G and 4G coverage from Three. Unlimited data gives you worry free internet use. Even if you used your phone for every minute of every day you could only use, subject to TrafficSense™, around 1000GB each month. We may use this cap to identify inappropriate use of the service, such as commercial use, which isn’t permitted under our terms and conditions. There is also a fair usage limit when you’re using your mobile phone abroad in a Go Roam country. This is currently set to 12GB outside Europe and 19GB inside of Europe (15GB on Pay As You Go). It’s also possible to buy a new smartphone on a 24-month contract with unlimited data included. Prior to October 2018, Three’s unlimited data plans had a restriction on tethering. It was only possible to use up to 30GB of tethering each month. This restriction has now been removed for all new and existing customers as a result of Ofcom’s net neutrality rules. Source: Three Help: What is unlimited data? On Virgin Mobile, an unlimited data plan is available but this is exclusive to customers who have Virgin TV and broadband at home. The plan comes with unlimited minutes, unlimited texts and unlimited data and normally costs £25/month. According to Virgin, there are no restrictions on “tethering, throttling, speed restrictions or caps”. Download speeds of up to 70Mbps are available on Virgin Mobile using 4G coverage from the EE network. Besides giffgaff, SMARTY, Three and Virgin Mobile, other UK mobile networks do not currently offer an unlimited data plan. 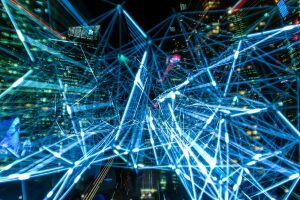 However, you might be able to get a very large data allowance (for instance, EE offers up to 100GB of data per month in their EE Max price plans). 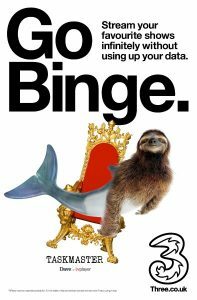 Three offers an inclusive service called Go Binge to all customers with a Pay Monthly plan with at least 12GB of data per month. This gives you unlimited data for use in six applications: Netflix, TV Player, Snapchat, Soundcloud, Deezer and Apple Music. Usage of these six services is “zero-rated” so will not count towards your normal download allowance. For more information, please read our full review of the Go Binge service. On Virgin Mobile, data-free messaging is available to all customers with a 4G Pay Monthly plan. Usage of WhatsApp, Facebook Messenger and Twitter are zero-rated, so you can message as much as you like without worrying about how much data you’re using. Vodafone offers a choice of Vodafone Pass add-ons to customers who have a Pay Monthly contract with them (excluding Vodafone Basics). The passes give you unlimited data for use on selected services within the category of video, music, chat and social media. The passes are a paid-for addition to your normal mobile contract. Video Pass (£7/month): Netflix, YouTube, Amazon Prime Video, DisneyLife, My5, TVPlayer and UKTV Play. 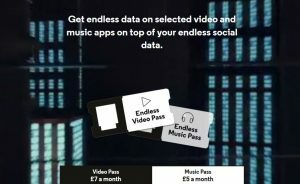 Music Pass (£5/month): Spotify, Apple Music, TIDAL, Deezer, Amazon Music Unlimited, Amazon Prime Music, SoundCloud, Primordial Radio and Napster. Chat Pass (£5/month): WhatsApp, Facebook Messenger, Viber Messenger and Call+. Social Pass (£3/month): Facebook, Twitter, Instagram, Pinterest and Snapchat. All four passes can be purchased as a Combo Pass bundle for £15/month. For more information, please read our full review of Vodafone Passes. VOXI is Vodafone’s low-cost sub-brand for customers who are under 30. On VOXI’s flexible 30-day rolling plans, you’ll get “Endless Social Media” with zero-rated data on Snapchat, Instagram, WhatsApp, Facebook, Twitter, Pinterest, Viber and Facebook Messenger. You can add a VOXI Video Pass for £7/month or a VOXI Music Pass for £5/month. These passes work in the exact same way as they do on Vodafone, giving you endless data on selected video and music streaming services. Occasionally, other mobile networks may choose to zero-rate selected apps and services on a promotional basis. For instance, EE offers zero-rated data for Apple Music during the six month free trial available on EE Pay Monthly plans. For more information on specific unlimited data plans, please see the giffgaff, SMARTY, Three and Virgin Mobile websites. For more information about zero-rated data offers, see the Three, Virgin Mobile, Vodafone and VOXI websites. Any thoughts Ken, on using an unlimited data plan as a sort of proxy for WiFi? Maybe using a dedicated MiFi device or even a phone as a hotspot… If say one wants the flexibility, not being tied into a long broadband contract etc? Speed of connection 4G mobile data vs. Broadband Wifi? What do you think? Many thanks for your comment. Typically, you’ll be able to use an unlimited data plan through tethering or portable hotspot on your other devices (e.g. your laptop or tablet). However, speeds are slowed down after the first 9GB/month on giffgaff and tethering is limited to 30GB/month on Three. Therefore, these tariffs might not be a very good replacement for your normal home broadband/wi-fi service. There are some mobile broadband tariffs designed for use in the home – for instance, Three’s HomeFi which gives you 40GB of data for £24/month or Relish which gives you unlimited data from £20/month if you’re living in Central London. Both of these can be a good replacement for home broadband if you’re in an area with good coverage & if the data allowance is enough for you. Three have now increased the add-on’s price from £15 to £20 unfortunately. A massive thank you for the heads up about the iD Mobile offer. We’ve now removed it from this page as they’ve dropped the tariff down to 10GB per month.